UPDATE: Grover Perkins has been located and is home with his family in Killeen. Family members of 76 year old Grover Perkins reported to officers that they last saw him on Friday, March 20, 2015 at 6:38 pm. Grover left his home in the 3200 block of Rampart Loop walking in an unknown direction. Grover is 5’ 4” tall, weighs 140 lbs, bald, and has brown eyes with a large white beard. Grover walks with a cane and was last seen wearing a navy blue shirt, jeans and a jean jacket or black windbreaker. Grover has talked about going to Louisiana and officers are concerned for his welfare and believe he might be lost. Officers are asking anyone who sees Grover Perkins or knows of his whereabouts to contact the Killeen Police Department at 254-200-7905 or in the event he is somewhere other than Killeen to contact the local law enforcement agency. Killeen Police are asking for the public’s help in locating an elderly man. 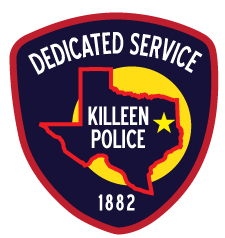 Killeen Animal Services Officers responded to the 4200 block of E. Stagecoach Road on Wednesday, March 18, 2015, in reference to a dog killing a skunk in the backyard of a residence. The skunk was picked up and per protocol it was processed for testing at the Texas Department of State Health Services, Austin Laboratory. 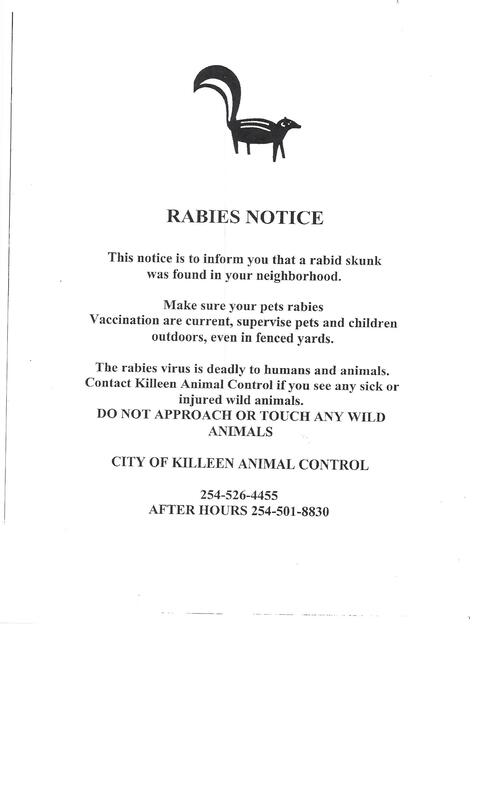 The Texas Department of State Health Services notified the Killeen Animal Services Unit on Friday, March 20, 2015, that the skunk tested POSITIVE for the rabies virus. It is unknown if the skunk bit the dog therefore as a precautionary measure, the dog will be isolated for 45 days. The Killeen Animal Services Unit will be distributing handouts in the area of the Yowell Ranch Subdivision to ensure the residents are aware of this incident, the potential danger that has been identified and have a chance to prepare. In the event that you see an animal that appears to be sick or acting peculiar, please contact the Killeen Police Department at (254) 501-8830 to have an Animal Services Officer respond. Please do not attempt to handle the animal as it could be infectious. Killeen Police Department investigates a suspicious package. Officers responded to a 911 call, at 5:44 am, in the 900 block of W CTE, on Wednesday March 18, 2015, in reference to a suspicious vehicle. Upon their arrival they made contact with a, 26 year old, black male sitting inside a 2004 gold Saturn. The male gave officers consent to search the car and that is when officers found a package they believed to be suspicious. Following protocol, the Killeen Fire and Hazmat Unit were deployed along with the Fort Hood EOD Unit. Fort Hood EOD was able to confirm that there were no mechanical components inside the package and it was turned over to the Killeen Police Department. UPDATE: The victim has been identified as 22 year old Jonathon Tyrone Bridges. Detectives are asking anyone who can has information about this incident to contact Crime Stoppers at 254-526-TIPS (8477), go online at www.bellcountycrimestoppers.com or text BELLCO along with their tip to 274637. Text HELP for help with the tip or text STOP to stop the tip, message and data rates may apply. All information is anonymous and confidential and if your tip results in the arrest of the suspect involved in this crime you could be eligible for a reward up to $1,000 in cash. Correction: The operator of the motorcycle, 25 year old Dominic Marcus Poydras, was transported to the Carl R. Darnall Army Medical Center where he succumbed to his injuries and was pronounced deceased by medical authorities at 1:52pm. Killeen Police Department investigates a fatal motorcycle crash on Stan Schlueter Loop. Officers responded to a 911 call telling them a crash involving a van and a motorcycle at the intersection of Stan Schlueter Loop and Bunny Trail at 12:52pm on Saturday, March 14, 2015. The preliminary investigation revealed that a 2010 Yamaha Motorcycle was traveling eastbound on Stan Schlueter Loop, when a 1998 Dodge Wagon Van turned south onto Bunny Trail in front of the motorcycle. The operator of the motorcycle was unable to avoid the vehicle, causing the motorcycle to collide with the right side of the van. There were two occupants inside the van; the right seat passenger was transported to Metroplex Hospital with minor injuries. The operator of the motorcycle, 25 year old Dominic Marcus Toydras, was transported to the Carl R. Darnall Army Medical Center where he succumbed to his injuries and was pronounced deceased by medical authorities at 1:52pm. Killeen Police are asking for the community’s assistance locating a witness. Detectives with the Criminal Investigations Division are looking for a possible witness, Shaian Marie Westbrook, of a criminal offense. Shaian Marie Westbrook is a 20 year old, black female with black hair and brown eyes, approximately 5’6” tall, with a tattoo on her lower left arm of “Jaycion”. Detectives are asking anyone who has information on the whereabouts this witness to contact Crime Stoppers at 254-526-TIPS (8477), go online at www.bellcountycrimestoppers.com or text BELLCO along with their tip to 274637. Text HELP for help with the tip or text STOP to stop the tip, message and data rates may apply. All information is anonymous and confidential and if your tip results in the arrest of the suspect involved in this crime you could be eligible for a reward up to $1,000 in cash.